New evidence shows that the Joint Commission’s “universal protocol” to eliminate the possibility of wrong site surgery or surgery on the wrong patient has not only been ineffective in reversing the number of wrong procedures, but the numbers of these “never events” have peaked since the commission’s protocols were mandated in 2004 for all surgical procedures performed in the United States. Supposedly, if surgeons and operating room staff use a written pre-procedure “checklist”, marks the area on the patient where the procedure is to be performed, and takes a “timeout” during the furious rush to create more cashflow for fat cats, obvious errors that should “never” happen will be prevented. A study published in the October Archives of Surgery finds that one reason that errors have increased is that Joint Commission-required “timeouts” are skipped, rushed, or may take place without the surgeon present in the operating room. The “universal protocol” solution illustrates another failure of a “top down” mentality when applied to the inexcusable failure of our medical system to ensure that a surgical procedure is performed on the correct organ, and on the correct patient. As mentioned in these pages before, the equally brilliant solution proposed by the Centers for Medicare and Medicaid in 2008? Hard to believe that this powerful remedy also failed to work. The only solution to this as well as many other failures of our medical system to function at a minimally acceptable level is to return to the “bottom up” model of medical care created by long term relationships between physicians and patients. When I participated in a special clinical clerkship in anesthesia many years ago, I made it my business to know everything possible about the patient we would be operating on, and started days before the procedure began. 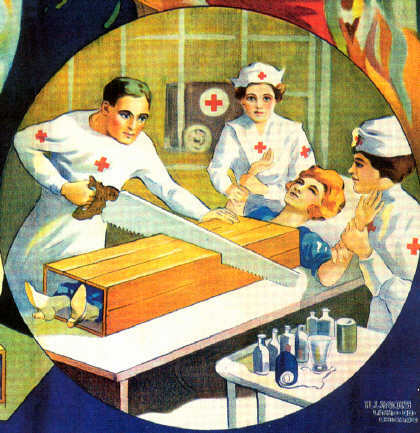 And, we were administering anesthesia, which necessitated constant control of the patient's life functions. There is no way that my preceptor or I would not be alert immediately if surgery was to go awry. There will never be a situation where surgery is not an extremely dangerous proposition, and things can, and did, very quickly go bad on occasions. What saved the patient was the integration of skilled, self motivated professionals who knew why they were there and what they were doing. It was rarely perfect, but I quickly understood the necessity for unified intent and integrated teamwork. No regulator or commission is going to find a rulebook that will create a culture of caring and good character for the members of the operating room team. Every factor which interferes with the establishment and sustainability of these relationships contributes to an environment in which impersonal, unaccountable, poor quality medicine is accepted and eventually established as the standard. The chickens of our government and employer-based third party payment and regulatory system have come home to roost, and no amount of feel-good regulation or "mandates" from outside bureaucrats will make any difference. So, until it becomes fashionable for the medical profession to return to serving only one master instead of a panoply of social engineers, businessmen, and political opportunists, you must have a trusted friend watch over you during surgery. Perhaps you must make your surgeon remove their mask before surgery so you can be sure that it is at least the correct surgeon. It might also be wise to ask the surgeon to document in the chart right then in front of you what the procedure is and where it should be before you allow any anesthesia to be administered. Perhaps everyone in the operating room should also be expected to sign this chart note as witnesses. The proliferation of bureaucratic "solutions" such as universal protocols reflects the continuing deterioration of American medicine.